Our planters are perfect long lasting gifts for most any occasion. These planters include an assortment of green plants suitable for indoors. Would you like to upgrade this garden? 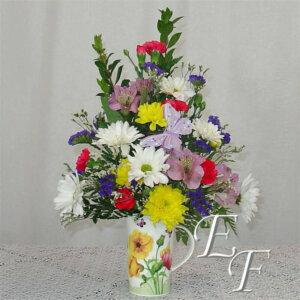 Would you like to add fresh flowers to your garden? Our planters are perfect long lasting gifts for most any occasion. These planters include an assortment of green plants suitable for indoors. As we are a growing operation, we make the gardens ourselves ensuring better quality and value for our customers. Planters done in baskets tend to be slightly larger than those of the same value done in ceramic containers. 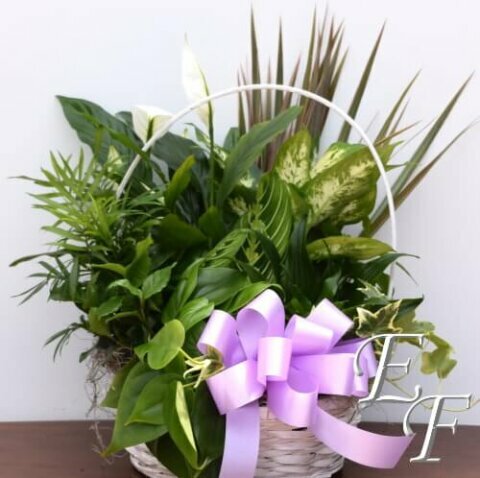 Our baskets and plant assortments vary depending upon availability. 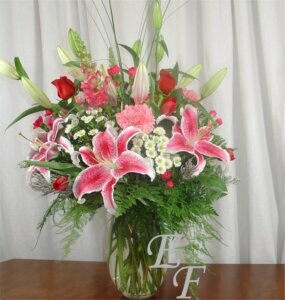 We have many options available to you so that you can customize your gift. All planters come with a bow, but you may also choose to add fresh flowers, special occasion picks, or a small ceramic angel pick. In the case of an expression of sympathy, you have the option of adding script. If you require a specific bow color or flower color, please note your preference in the special instructions. The Premium Dish Garden includes gardens priced from $59.99 to $99.99.